Even if the 4.8 had lost it would certainly have looked better doing it. That was a great video! Never saw it before, had a good feels all over again. 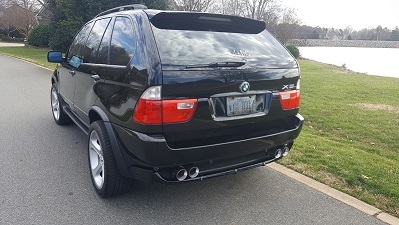 I've been drooling over the 4.8is X5s for years. Finally broke down [aka convinced the wife lol ] and bought one as a gift to myself for my 40th birthday. 2006 4.8is with only 74k miles. In pretty good shape with most of the usual issues already addressed. It's been a blast so far and fingers crossed I don't have to take any trips to the stealership anytime soon! Congratulations fishhouse4 and welcome in the circle. Funny enough I also got mine 2 weeks shy of my 40th last year and it had 72K miles. I really wanted a silver one but was not available then with my specs. Have seen one on cars.com with same mileage in Chicago is that you? Thanks man. Yea I saw that one as well - they must be twins. But it was little too far and expensive for me. Ironically found mine right across the street from a private party here in Richmond, VA.